Macknicki Ministries: Could it be... 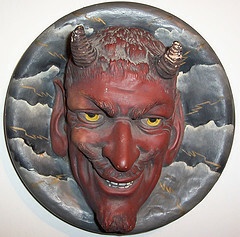 SATAN?! Home » Daniel , Ephesians , Evil , Satan , The Devil , Trials » Could it be... SATAN?! In this passage the angel Gabriel is speaking to Daniel and is explaining that he was delayed from coming to Daniel earlier due to a battle in which he ultimately required help from another angel, Michael. As we go about our daily lives and are absorbed in the cares of this world, we often forget that there is a greater battle going on all around us. This is a battle in which we too are involved, even if we don't always realize it. It can be much easier for us to recognize our own weaknesses or to look out at the world and see the temptations that it constantly places before us than to realize that there are spiritual forces at work in our lives as well. To this day I can't hear the name of Satan without hearing Dana Carvey playing the church lady on Saturday Night Live (back in the 80's for those of you too young too remember). One of the points of this popular little skit was to make fun of those who see Satan's handiwork in everything. It also served to make fun of those who believed that some red-skinned, horned, and caped guy with a pitchfork was going around meddling in people's lives. Many of us shy away from the mention of Satan because we are afraid that people will think that we believe this popular caricature of the devil. This, however, is not the biblical picture of the enemy that we struggle against. Our true enemy can best be seen examples such as in the Holocaust, in the rampant human trafficking trade that is alive and well today, and in the genocide in Sudan. Evil exists. Satan is real and he and his demons act in visible and tangible ways in our world. We should not, however, be the type of people that are so consumed with this fact that we see a demon behind every negative circumstance nor an angel behind every good deed. As we strive to grow in our relationship with God we must endure many struggles. These are struggles against our own sinful nature, struggles against the passions and lusts of the world, and struggles against the spiritual forces of our enemy who works constantly to hinder, to confuse, and to derail us at every opportunity. Always remember that Satan is powerful and wants nothing less than to lead you away from God. He is sometimes subtly seductive and sometimes terrifyingly brutal. It is for this reason that we must never rely on our own power but constantly seek the true face of God in all things.